The automation of robots and artificial intelligence is pretty well advanced in certain industries. The income now is shifting more and more to capital and away from workers, contributing to a general widening of inequality in the United States. Jeff Sachs argues that we need to pursue policies so that the coming generation of smart machines works for us and our well-being, rather than humanity working for the machines and the few who control their operating systems. 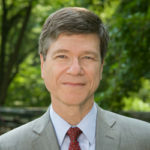 Jeffrey D. Sachs (@JeffDSachs) is Professor of Economics at Columbia University, a leader in sustainable development, senior UN advisor, bestselling author and syndicated columnist. Francesco Caselli is Norman Sosnow Professor of Economics, LSE, and Director of the Macroeconomics Program at LSE’s Centre for Economic Performance (CEP). The lecture is hosted by IGC and the Centre for Economic Performance.